You can meet a real Maiko at Gion Shinmonso. 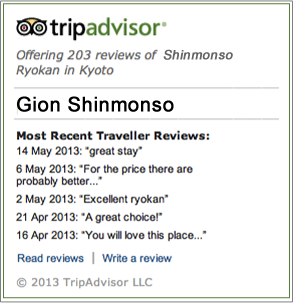 'How come Gion Shinmonso can call for a Maiko and other Ryokan's can't?' is a question we often receive from Japanese and foreign customers. Indeed, it is very unique for us to be able to have a relationship with a tea house that Maikos belong to. Being able to call for a Maiko needs a long term relationship. Gion Shinmonso has been working for over 60 years. From the first years that we started, we have always had a close relationship with the tea house. That is why if any of our customers wish for a Maiko, even if it is a sudden request, we have always been able to have her come by the next day. The prices are clearly set, and the landlady's watchfulness for everything makes the customer enjoy and relax. 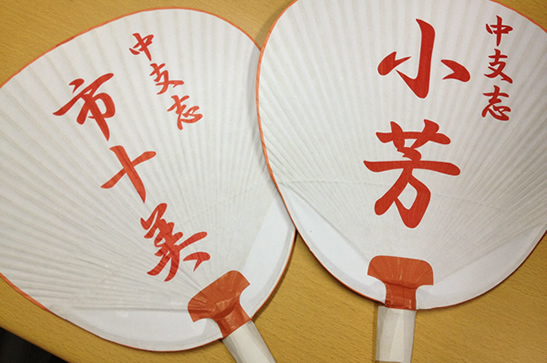 This is one of the main reasons why the Shinmonso Original Maiko Plan is very popular. The kimono and the obi of the Maiko is one of Kyoto's traditional crafts. The movement and the elegance of Maiko's dance is made up of their daily efforts, so just getting a glimpse has a lot of value. As the following sentences explain, the existence of 'Maiko' is extremely valued from the eyes of Kyoto and even the world. After coming all the way to Kyoto, you must see the real Maiko and enjoy the history of Japan. There are approximately 100 “Maikos” in Kyoto. Before the Second World War, there were over 1000 Maikos. Now there is only about one tenth of the number. During the time when all of Japan was in a poor state, even the young girls had to work in order to support the family. The women of today are able to work in a variety of different occupations. Modern day people that are able to bear the strict training have decreased significantly. This is one of the reasons for the decrease of the Maiko. 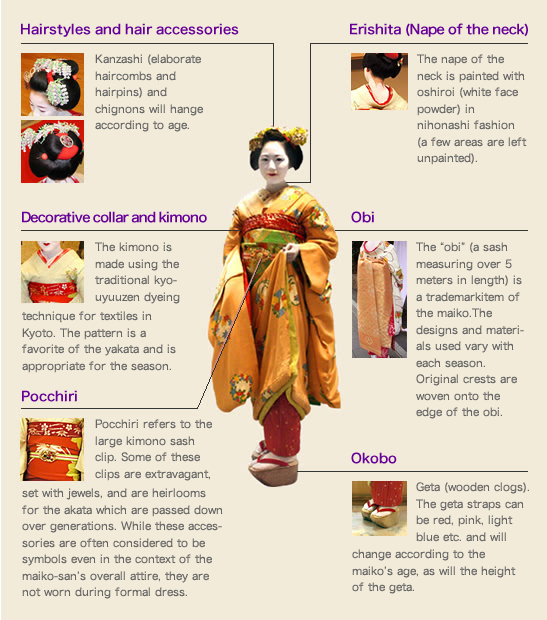 In all of Japan, only in Kyoto has the "Maiko" tradition continued to persist over the past several hundred years. Once finished with their education, the 15/16 year old girls separate from their parents and homes and begin their daily lives in a Kyoto Tea House. The owner of the tea house, the manager will give the orders. Then the senior members and Maikos will continue daily life with each other. There are currently only 10 pure Kyoto born Maikos. The Maikos born from Hokkaido to Okinawa have trouble getting used to "Kyoto's dialect"
Much time is required in order to grow accustomed to Kyoto's unique intonation and distinctive dialect. 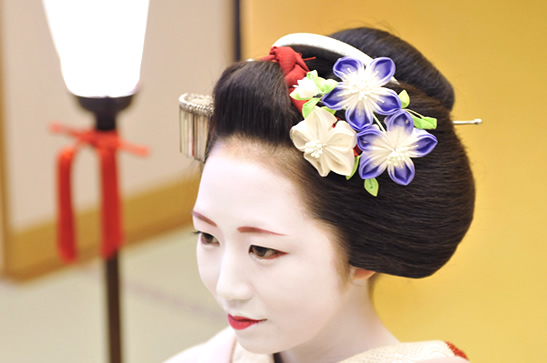 To become a real Maiko, it usually takes about 1 year for the Maiko to get used to rules, culture, and life in Kyoto. But for those who are entering, about 80% resign within 1 year. Without getting used to the strict structured society, many give up from not being able to show self-expression. Information from the internet is nothing compared to the real training required to become a real Maiko. The Geiko is able to continue working until she gets married. The oldest Geiko up to date is in her 80's. Foreigners are often surprised by that marriage = retirement. 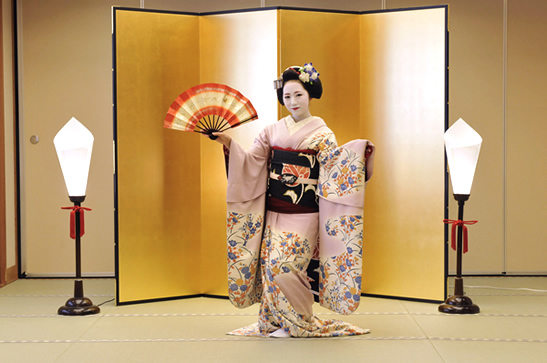 With white make-up and a wig, and a specialist at dancing, the Geiko is around her 40's. Geikos over 50 years old can be seen playing the Shamisen and hosting banquets from place to place more frequently than younger Geikos. Because the Maiko's pay is completely controlled by the manager of the Tea House, the Maiko does not even know their hourly earnings. Once becoming a Geiko, the Geiko can work on her own without a manager controlling her earnings. 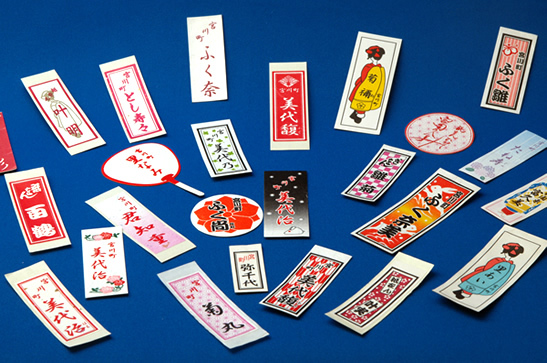 In order to purchase a Kimono some Geikos will loan money from the bank. On the other hand, there are Geikos who can easily afford a kimono with their own earnings. Why become a Maiko? Why put on the white make-up? What kind of life do you live during the day? What's the most difficult thing you have experienced? What is the difference between a Geiko in her 70's and a Maiko? Although the Japanese people are familiar with the traditions of the Maiko and Geiko, they still remain interesting and mysterious. Please with interpretation, hear the reply from the Maiko yourself. Experience it in Kyoto, the heart of Japanese culture. Maiko will visit the roof top beer garden everyday. 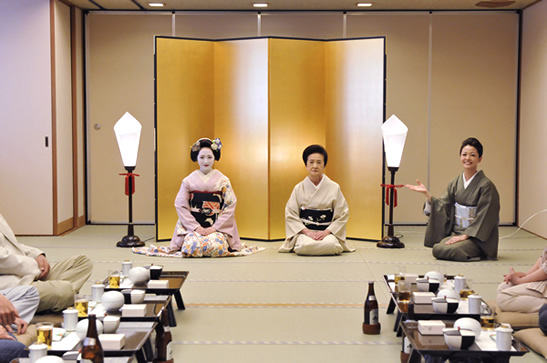 During hours when maiko will be in attendance, they will make rounds to each table. Enjoy a pleasant chat and feel free to take pictures with them. 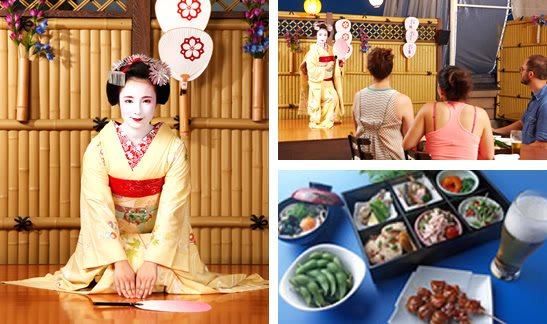 At around 8:00pm, the maiko will perform two kyomai (Kyoto style dance) on our special stage. you can download from here the information of beer garden in English. Reservations can be made for two or more people. Maiko will be in attendance from 6:00-8:00pm. The beer garden is completely undercover making it the perfect venue in all kinds of weather. We kindly request guests order the course menu when using the beer garden.